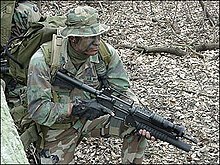 Special forces, or special operations forces are military units used to trained to perform unconventional (not ordinary), difficult, often high-risk missions. They are highly-trained and are the most valuable units in the world. 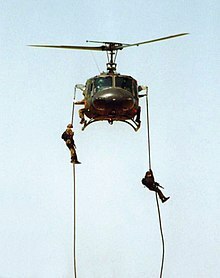 Because of the hard training and the high risk, there are not many special forces units. Those elite units are often used to operate deep behind enemy lines. In a war they are also used for unconventional warfare. Special forces were very important in the history of warfare where war is more defined as "hit and run" and sabotage, and not traditional army combat where quantity was more important than quality. The Chinese strategist Jiang Ziya said about 1,000 B.C. ago that such elite units had many advantages, recruiting talented and motivated men to be serving in specialised units should be more important than other things. Special forces were formed in the early 20th century, during World War I. In this "big" war, military operations inside enemy territory showed tactical benefits. They were often used to sabotage enemy infrastructure like radio stations, which are important for communication between the troops. Special forces units gained more importance during World War II, when technology became more important. Our mission is to kill people and destroy things. [...] We are killers, not auxiliaries or instructors. ↑ see Anglim, Simon: Special Forces - Strategic Asset. : Infinity Journal, 2/2011, p.16.